Dan Butler hit .227 with four home runs and 28 RBIs in 76 games this year for Pawtucket. Catcher Dan Butler wasn’t quite sure why he had been pulled from the game in Pawtucket Friday night. 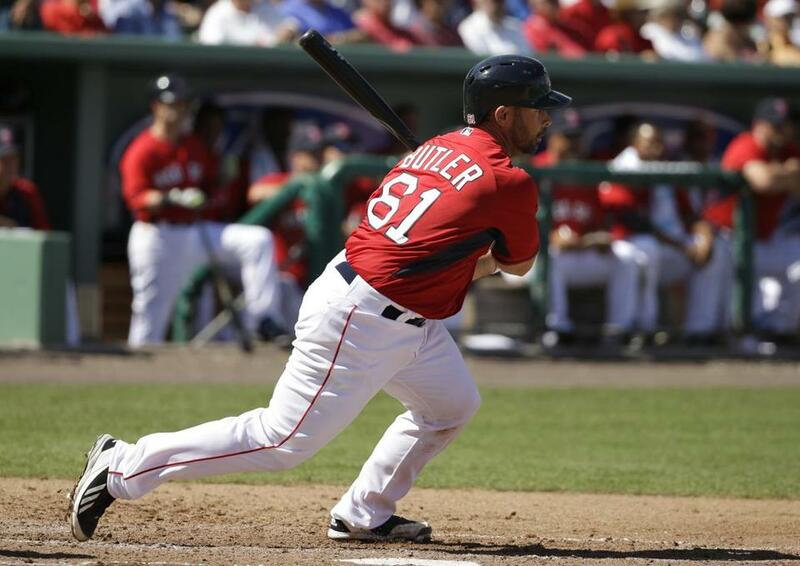 The PawSox were trailing Syracuse en route to a 6-2 loss, but Butler had been playing well. He had two hits in three at-bats, and most importantly, he was healthy. “When I got pulled out, I was kind of confused a bit. I wasn’t hurt, so that was a plus. I was hoping it wasn’t performance related,” Butler said with a laugh. Little did Butler know that at Fenway Park, catcher David Ross had injured his foot trying to beat out a ground ball in the sixth inning of the Red Sox’ 4-3 win against the Yankees, and that the 27-year-old minor league journeyman would be on his way to the big leagues. Ross was placed on the 15-day DL after rupturing the plantar fascia in his right foot, and Butler received the call on Saturday morning. He was coming to Boston to back up former Pawtucket teammate Christian Vazquez. Butler’s promotion to the Red Sox is the latest chapter in the catcher’s improbable journey through professional baseball, which began when the team signed him as an undrafted free agent from the University of Arizona in 2009. The fact that Butler, a backup at Arizona, has ascended to the majors is astounding. The Red Sox took notice when Butler was a Cape Cod League All-Star and offered him a deal to play for the Lowell Spinners, paying him next to nothing. Butler had a year of eligibility remaining, but he accepted the offer. All it took was one break. The next season, in 2010, he hit .327 with six homers and 31 RBIs for Greenville in Single A, before being promoted to Salem, the Sox’ High A affiliate. In 2011, Butler hit .241 with 12 homers and 71 RBIs in 113 games between Salem, Portland, and Pawtucket. He spent most of 2012 in Portland and played his first full season in Pawtucket in 2013. There, he was named the team MVP and hit .262 with a career-high 14 homers in 84 games. For the better part of the Butler’s minor league career, the Sox organization has been well-stocked with catchers. There are highly touted prospects such as Vazquez and Blake Swihart. At the major league level, the Red Sox had veterans such as Jarrod Saltalamacchia, A.J. Pierzynski, and Ross. But the dominoes started falling. Saltalamacchia wasn’t re-signed in 2014 and was replaced by Pierzynski, who was designated for assignment in July. Once Ross was injured, Butler’s improbable path to the majors was complete. Often, Butler reflects on his days in Lowell, and what would have been if he had chosen to return to Arizona instead. “I think I thought about that last year, just how quick things can happen in this game and how quick things did happen last night,” Butler said. “From playing, getting ready to play the Columbus Clippers today, and then I get pulled from the game and I’m here talking to you guys in a major league clubhouse. Butler hit .227 with four home runs and 28 RBIs in 76 games this year for Pawtucket. While he’s struggled slightly at the plate, he’s defensively sound. He’s thrown out 13 of 48 base stealers this season. His offense has also improved as of late, with eight hits in his last 10 games. Perhaps Butler’s most valuable asset is his familiarity with the pitching staff. After the Red Sox gutted the rotation at Thursday’s trade deadline, pitchers Tommy Layne and Alex Wilson were recalled from Pawtucket on Friday. Butler also has worked with Brandon Workman and Allen Webster, who started Saturday, in the minors. Hopefully, for Butler, his major league debut will come sooner than later. When the time does come for him to start, his teammates will be pulling for him, especially the guys he spent time with in the minors.